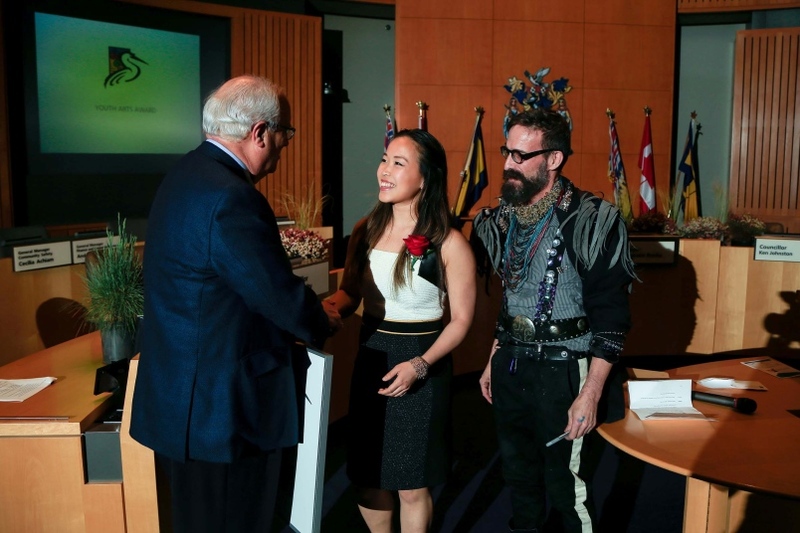 The City of Richmond’s annual Arts Awards recognize the achievements and contributions to the arts by Richmond residents, artists, educators, organizers and business leaders. 2018 marks the 10th year anniversary of the awards since the awards' inauguration in 2009. This year I was nominated and selected as a finalist for the Youth Arts Award. This award recognizes a performing, literary or visual artist, 24 years of age or younger, who has demonstrated outstanding promise and commitment to the Richmond arts community. The award recipients were announced at a ceremony at Richmond City Hall on May 15th, 2018. I am so honoured that I was selected as the winner of this year's Richmond Arts Awards in the youth arts category. • In June 2016, I graduated from the fine arts diploma program at Langara College and graduated with a scholarship from the ceramics department. Since 2012, I have been a part of the media lab's Richmond Youth Media Program. The lab has been an integral resource for me as an artist to develop my photography and design skills and try out other media skills of interest. I also found lots of media art related volunteer opportunities through the media lab. My favourite experiences included volunteering as a filmmaker and an event photographer for events such as culture days. Through the lab, I managed to make connections and collaborate with various youth, professionals, and organizations. I'm so happy to have these mutually beneficial experiences that really gave me the momentum to develop myself as an artist. One of the larger collaborative projects was Arts in the Park: a single day, youth-led outdoor arts festival for youth by youth in the summers of 2013 and 2014. I managed to co-found, direct, and do all the design work for this festival. All these projects I participated in have given me so many invaluable skills and experiences. Next year, I will be finishing my BFA with a major in ceramics at the Nova Scotia College of Art and Design. Already, all my digital art foundations have helped me. I am so excited to continue to see how my interests will develop my work and finding exciting ways to promote the arts within the community. Thank you again for selecting me as the 2018 Richmond Arts Awards’ recipient of the Youth Arts Award! Studio Magazine: Under the Radar Feature! I have such wonderful news to share: I was featured in this issue of Studio Magazine in their under the radar section! They don’t have an online version of their magazine. However, this issue will be on shelves until March 2017. I am delighted to be one of the three artists whom they’ve chosen to feature. I'm on page 59 if you happen to have a tangible copy. "2016 winner of the Craft Council of BC Emerging Artist Award in ceramics, EMILY MAY's work is already celebrated and spilling beyond the borders of a ceramic practice. Initially drawing guidance from her materials, May is driven creatively forward by a desire to challenge status quo opinions and belief structures. She is especially concerned with stigmas surrounding mental health and presents work that powerfully – if subtly – confronts common stereotypes with a critical humour. She seeks to examine society's obligations to the individual. May uses sophisticated which to capture a commentary on the zeitgeist that doesn't get bogged down but rather elevates the political – both theoretical and practical – making the viewer smile, think and change. May is just completing a Fine Arts Diploma at Langara College in Vancouver and it will be interesting to watch where her broad interdisciplinary interests take her." Although names and titles don’t really mean much, I’d like to acknowledge that it is such a privilege to be considered at the same level as two artists with so much more experience than me: Michelle Wilson (who has completed her BFA and MFA) as well as Erin Callahan St John (who has completed her BFA and has had an apprenticeship opportunity)... and then there’s me—with my little, two year, fine arts diploma. I am so excited to see what the future has to offer! Thank you so much to everyone who has supported me on this journey! Today, I went to the first of a few meetings for a show at the Craft Council of BC. This opportunity was a part of the Ceramics Scholarship that I had won back in April. This award gives emerging artists, who have just graduated from a post-secondary school, some useful benefits and services that can facilitate their start in the arts, specifically contemporary craft. The 2017 exhibition will be curated by Penny Parry. So, it is sure to be fabulous! I’m so excited to collaborate with them on a theme and work together to create this exhibition! Keep your eyes out in January for more details about this exhibtion! Earlier this year, in January, my dear friend, Stephanie Petrovic, asked to interview me as part of her group project for school. I was so humbled that she thought of me as a good representative of local arts. Burnaby Connect is a show run by youth for youth be sure to check it out! I've included the episode below. This months Burnaby Connect show brings you all things art and entertainment! Watch as the student of Burnaby Connect unveil what people truly think about the arts and how you yourself can truly find a way into the arts, after all, someone has to create the content on netflix, enjoy! The free, two-day ceramics workshop was a lot of fun to coordinate and lead with fellow ceramicist, Jordan Price! We wanted to create dialogue around personal symbols and functionality in a 2 part workshop. We were pleasantly surprised with how many people signed up! We had the pleasure of introducing clay to some people who had never played with clay before but also helped other individuals who have had experience with clay. For the past two months, since April, I’ve been working hard with a group of artists to have a show in New Westminster that merges art and heritage. I was delighted to apply and be one of nine artists accepted for such a wonderful opportunity. The project is for youth artists, aged 17-24 and is being led by the wonderful Cindy Mochizuki. Each artist has been working to create their own work that is influenced by the City of Westminster’s Archives and Collections. The opening is tomorrow evening, June 23rd, from 6-8pm and all the artists who were a part of the Living Archive Project will be present. Each artist will be giving a small talk on the breadth of their work within this project. The show will be on until Sunday, August 21st, 2016. Please be sure to go and check it out! The art is between three sites: the New Westminster Museum (at the Anvil Centre), the Samson V, and Irving House. I’ll include the exact addresses at the end of the post. Those with an interest can follow the artists’ journeys through our blog at www.livingarchives2016.tumblr.com and are welcome to attend a panel discussion with the artists on Thursday, June 30 from 5:30 – 7:00 PM at Anvil Centre. The 2016 Richmond Arts Awards were presented today and I am happy to be considered as one of the finalists in the Youth Arts category! The other finalist is Anna Toth (musician) who happens to be one of my friends. And the winner is Nancy Zhang (flutist). Congratulations to these two in addition to the winners and finalists of the other categories! Wow! The Langara Grad Show opening tonight was so much fun! I’d like to thank everyone who came out for joining me at the opening! Furthermore, at the opening, 8 awards had been presented. I am honoured to announce that I was presented with the Ceramics Studio Award by my wonderful instructors, Sarah Coote and Alwyn O’Brien. I couldn’t have been more overjoyed! I’d like to take this time to thank the people associated with the The Avery Huyghe/Jack Diggle Memorial Award in addition to the Craft Council of British Columbia for contributing to this scholarship. I am excited to see what the future in Ceramics has for me. Apologies for the blurry photo! My friend captured it for me and he was so excited at that moment. It's the only one I have! If you didn't have a chance to see the show tonight, our pop-up gallery is on until April 28! (That's another week!) We've all worked hard all year. So, be sure to check it out! Each artist had between 1-6 pieces juried into the show. I was fortunate enough to have all 6 of my submissions selected! On my instagram, I posted a little collage with close ups of all my pieces on display at the show. Try to find them all! I am excited about my journey as an artist. Thank you for following along and supporting me! I can't wait to share more with you as various opportunities arise. Copyright ⓒ Emily May, 2012-Present. All rights reserved.